You carefully planted your garlic last fall. You cared for it all spring: watching its water, fertilizing a few times, weeding the patch well. Sometime around July you harvested a bundle of gorgeous bulbs and dutifully hung or laid them somewhere to cure before long term storage… Wait, you did do all this stuff, right??? – No? 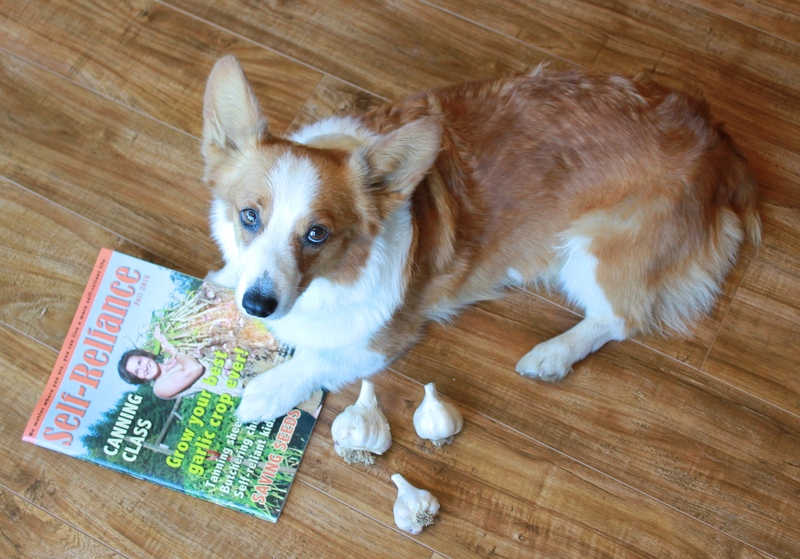 It’s time to revisit some of my other garlic growing posts and to check out the Fall 2016 issue of Self Reliance Magazine for my complete guide to growing garlic for the home gardener! 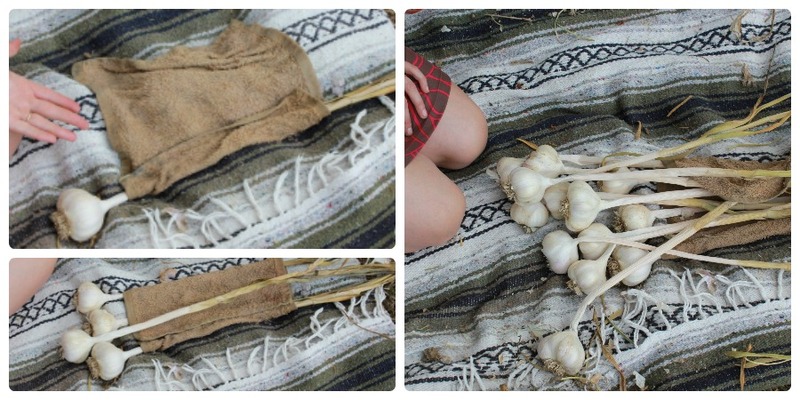 Anyhoo – you’ve got yourself some soft neck garlic that has cured 3-5 weeks. (Curing is important: Don’t trim the roots before they’re cured: the roots help to facilitate the drying process. Any other cleaning at harvest time is also not recommended as the bulbs are very tender at that time. 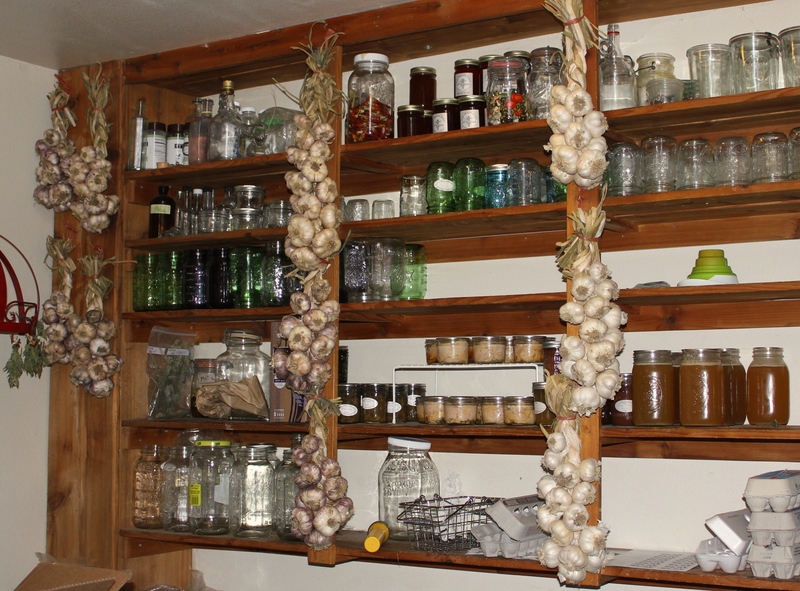 Garlic should be hung in a cool/dark place with plenty of ventilation.) The roots are good and shriveled/dry an the paper wrappers around the bulbs are nice and papery. 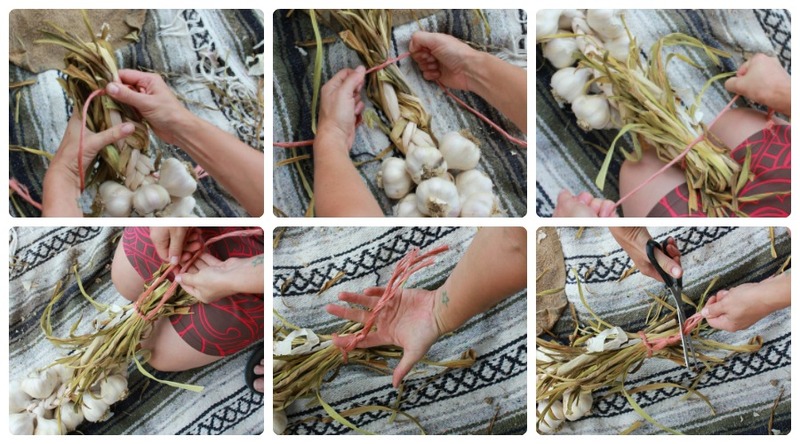 It’s time to braid your garlic! Braiding itself require a bit of practice and for me, requires chanting an out-loud mantra, but also requires a bit of prep. 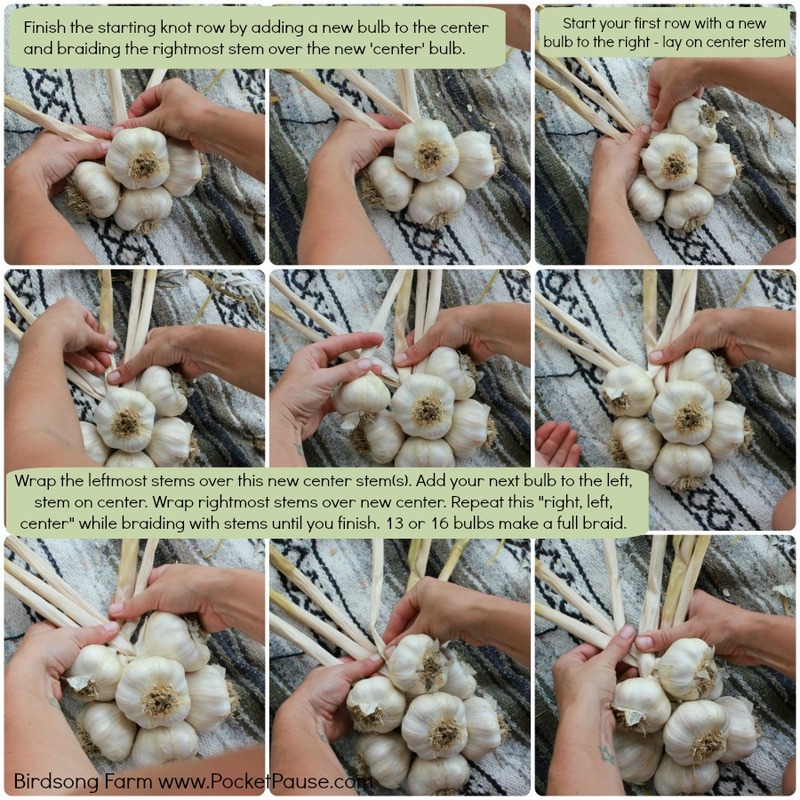 This post will most likely be a bit long but hopefully by the end you will have a VERY good idea on how to braid your own garlic. You can click on the images to see larger versions. Let’s get started! 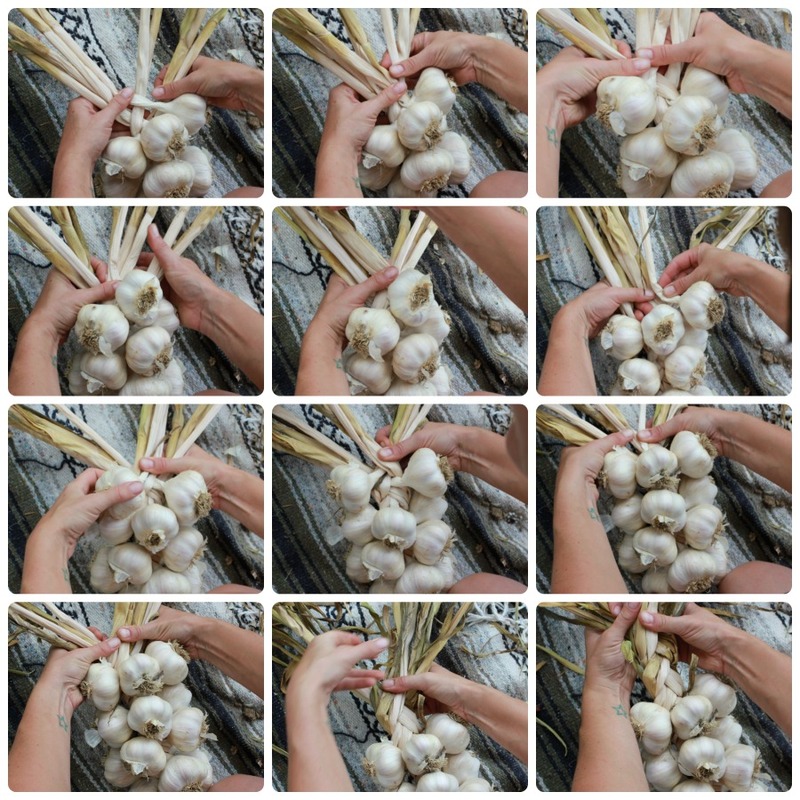 Choosing your garlic: Softneck garlic store longer than their hardneck cousins and have softer necks (duh) making them easier to braid. 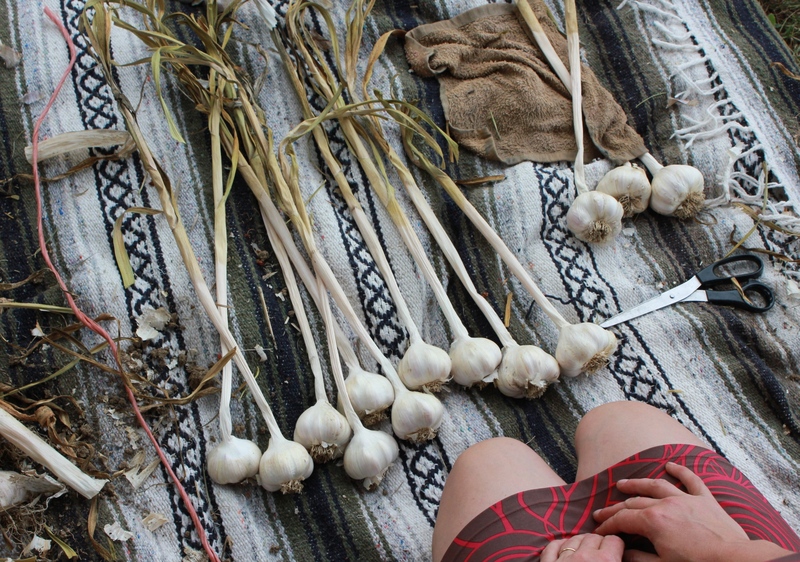 My favorite braiding garlic that i grow is Nootka Rose – they clean up beautifully and the stems are very pliable. 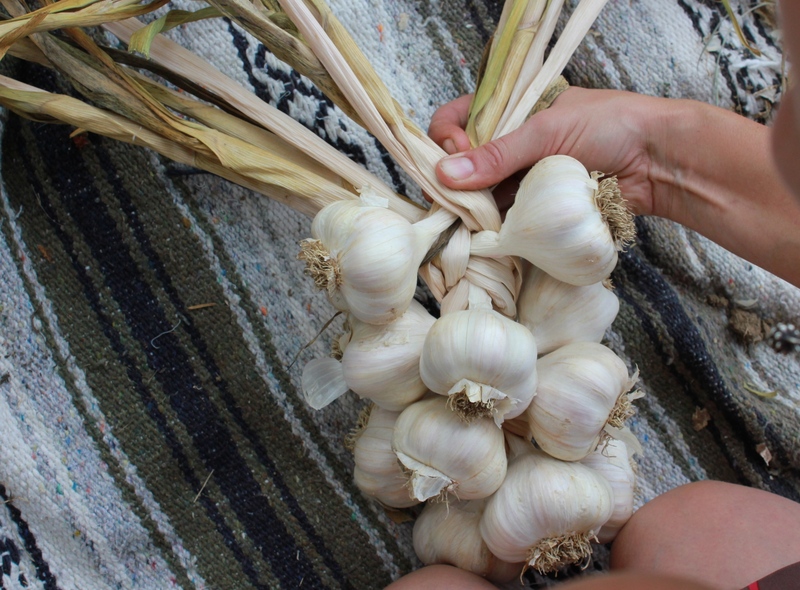 Nootka is a Silverskin garlic which occasionally sends up harneck like scapes – trim those bulbs off your bundle and store separately in a cloth bag or ceramic crock as they will be too difficult to braid. 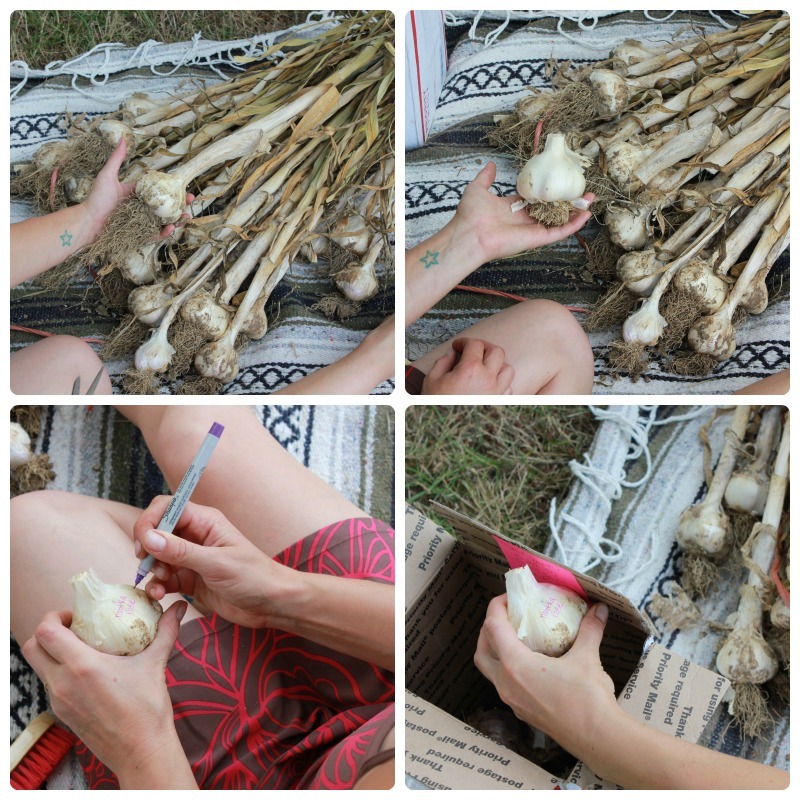 Sort, Set aside, Clean: Before i begin braiding, i first sort through my garlic to choose the largest bulbs to keep for fall planting. For my 10×30 foot patch i hold back around 30 big bulbs of softneck and 15-20 or so of hardneck. If this isn’t enough, i can always pilfer my braids. You can write right on the bulb with a sharpy to label your variety. To clean your garlic, use a scissors to trim the roots off tight to the bulb. Use a soft brush to brush out all the dirt. Carefully break off the outer layer or two of wrappers (not too much or the bulb will be exposed and won’t store as long!) to remove the dryer/stiffer outer stem. This will result in a very clean looking bulb of garlic and more workable stem. I like to braid 13, 16 or 19 bulbs per braid. Prepare a wet towel and lay 4 of the largest bulbs on this towel after you’ve cleaned them up, wrapping the stems close to the bulb. Let soak while you clean the remaining bulbs. Alternatively, you can dampen all the greens of all the garlic for a really clean looking braid. I’m not entering anything in the fair so i’m more concerned about facilitating the starting knot than making a really clean braid. Once all the bulbs are cleaned and soaked to your satisfaction, arrange bulbs in the order of size. You will begin braiding the largest 4 and work your way up/ small. 2. Take the stem of bulb one and wrap it over 2,3/ left,center; under itself; then over the 2,3 stems again. Once you have this knot, finish it by adding a 4th bulb in the center. Always add every new bulb so that their stem is being added to the existing center stem(s). Add this first bulb to the center. After this always add new bulbs in the pattern: right, left, center, as you did with the starting knot. Hopefully you are familiar with how to braid. 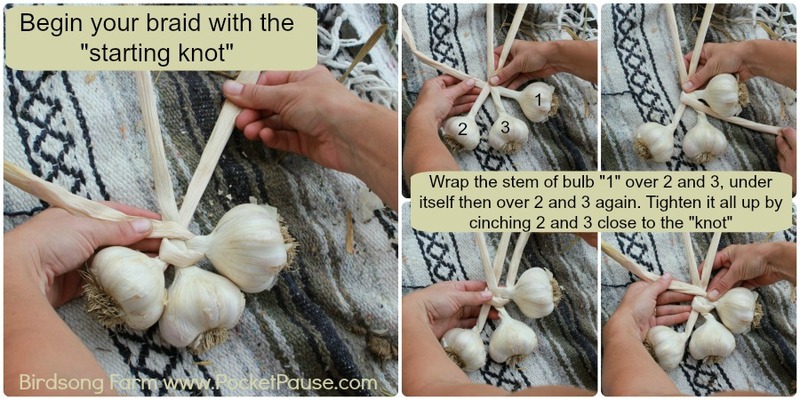 While you are adding the garlic bulbs in the “right, left, center” pattern, you are also braiding the stems as you would anything. The lowest (farthest back) stem(s) is always the stem(s) that you braid over your new center stem. It can be confusing, but when braiding the stems you are alternating left, then right, then left, always braiding the outer/furthest back stem over the center stem while your bulb addition pattern is ‘right, left, center’. I told you it takes some practice and chanting! 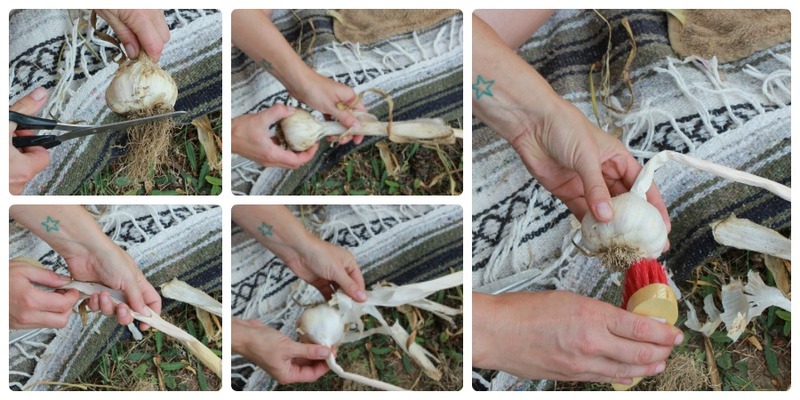 Finishing the braid: Keep adding your bulbs and braiding your stems, finishing on a center bulb. From this point continue braiding the stems for a few inches. With your length of twine, tie a tight knot to tie the end of this braid. Fold the remaining stem ends over backwards (Make the fold at least an inch above your first knot) and tie again behind your braid. Double knot this tie then create a simple knot with the end of the string to create a loop for hanging. Cut off the string and stem ends and VOILA! Depending on the variety of garlic you grew and how well you cured it, these braids could last up to a year if hung in a dark, cool room. To remove a bulb, simply twist it a few times to pop it off the braid. Use the bulbs at the top first. Garlic braids are a wonderful way to store a delicious crop, make special gifts and are “pretty enough to eat.” I hope you’ll try it for yourself! 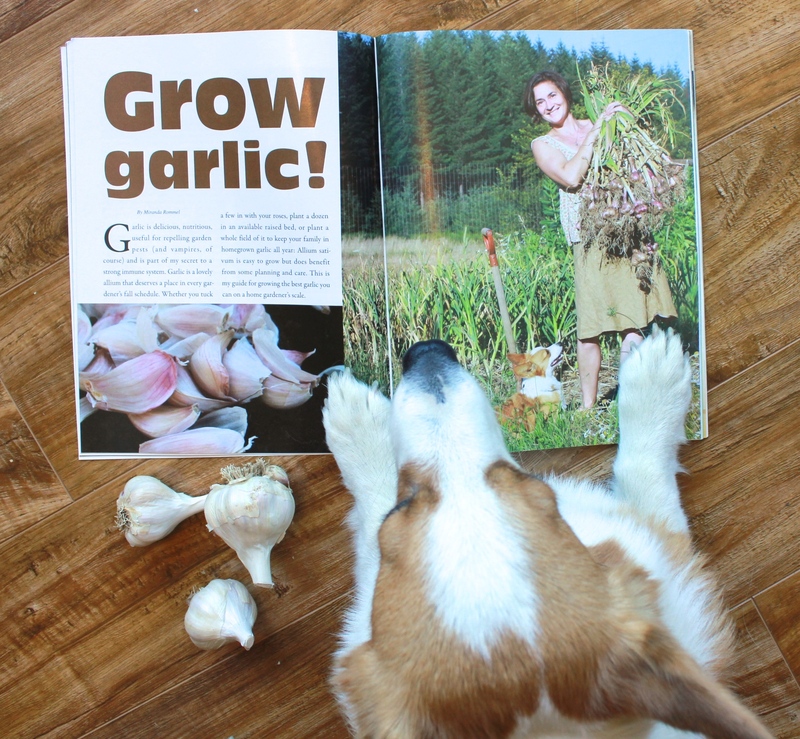 Read lots more about how to grow garlic in the fall issue of Self Reliance Magazine and search this blog for more posts. You can find even more resources at some of my favorite websites and blogs from my resources page. Happy braiding!